a2b Fulfillment is proud to once again be an exhibiting sponsor for the Georgia Logistics Summit. Hosted by the Center of Innovation for Logistics, the event will be held May 16th and 17th at the Georgia World Congress Center in Atlanta, Ga. The logistics industry has seen major growth in the state of Georgia in recent years. Thanks to its convenient location within the southeastern U.S. and its business-friendly climate, more and more manufacturers and third party logistics providers are moving into the state of Georgia. But perhaps the biggest factor is the terrific infrastructure in the state; including the Ports of Brunswick and Savannah, roads and rail system and the Hartsfield-Jackson Atlanta International Airport. 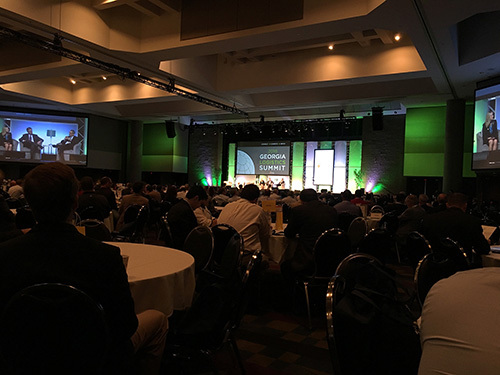 Last year more than 1500 attendees were present for the Georgia Logistics Summit; including executives from the Ports of Brunswick and Savannah and Hartsfield-Jackson Atlanta International Airport. Many industry leaders are once again lined up for expanded Roundtable sessions, shipper-focused sessions and a new showcase by logistics technology providers. The event also offers ample opportunity for networking and meetings with potential clients and vendors. For more information on the Summit, view the 2017 Georgia Logistics Summit Agenda.